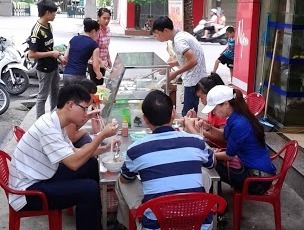 Coming to my country, you may see Vietnamese street food is very common in our daily living. Eating to fulfill stomach and maintain energy takes important part during trips. Foods sold along streets offer more than that, and people love them. I am going to show you 6 main reasons why people love this type of food. In Vietnam, you can watch street vendors preparing foods with various fresh ingredients right in front of you. Usually, meat, herbs, and raw vegetables are used up within a day. Besides, street vendors often sell one or two dishes only, ex. Pho noodle, spring rolls, which is their family traditional profession for decades, even generations. Thanks to their profound cooking experience, skills, and possibly some culinary secrets, their foods are likely so mouth-watering that makes you unforgettable. Calories of Vietnamese foods depend on ingredients in each dish, but most come from carbohydrates and protein rather than fat. That’s why travelers can freely enjoy street foods here to get enough energy but don’t have to worry about high fat content. Think about the fact that you can get good food almost any time at any place, by just walking a few minutes. This is very suitable to tourists, who need to have delicious and high energy, but easily found meals. When you want to have more time for moving, and lessen time on eating, street foods should be your priority option. Street food is surely cheaper than restaurant food. That’s because mobile vendor’s operating expense is pretty low compared to what restaurants have to bear: house rental, waiter/waitress, light, air-conditioner… Many street vendors only need a mobile cart or stall (food trucks are not popular in Vietnam) with tables and chairs to start serving great meals. In terms of prices, you can well have a good breakfast at about 2 US dollars, with a bowl of Pho and a glass of iced coffee. The economical advantage makes it very suitable to backpackers and budget travelers, who may want to save cost to do other wonderful things like: tasting various dishes, visiting more places, buying local souvenirs, etc. It’s a great way to understand local culture through enjoying food, life style, and daily living on streets. You can view a living aspect of local people; see what and how they actually eat (ex., by chopsticks). By that way, you have a chance to interact with locals, make new friends, and learn or practice Vietnamese. Eating on street stall appears a nice way to avoid tourist trap, which travelers may get in touristy restaurants. Street vendors usually treat foreign visitors similar to natives. That will help to enrich your real experience about a new land, culture, and people. Is that what you want during visiting a foreign country? Surely it is. I believe all of us like the feeling of helping other people. What’s better when we can enjoy a good meal and also support other (usually poor) people to make ends meet? The action simply follows the eastern philosophy “Givers gain”. You give what local citizens deserve earning (by serving you good food), and likely get back, at least the feeling of deliciousness, fullness, and satisfaction. Having said above reasons, I’d like to introduce the top Vietnamese street foods for your consideration. Why don’t you try tasting some of them and give your comments? By the way, if you find this article useful, would you mind click the Like button to encourage me? I’d love your thumb up!